We love Ireland, and are thrilled to include County Cork as one of our Ireland rowing tour offerings. We will begin with a visit to Cork City and a row on the River Lee. Skibbereen is the home of the famous and funny O’Donovan brothers, who won the first Olympic rowing medal for Ireland at Rio 2016. They entertained the world by describing their race strategy as “eat steak and spuds and pull like a dog”. There are other connections to strenuous rowing in this part of Ireland, but we will have a more leisurely approach, taking time to enjoy the magnificent scenery we will row past. We might eat some steak and spuds, but the seafood is magnificent. Enjoy a new and different taste of Ireland. Here is a good trivia question: why does Baltimore, Ireland have a pub called Algiers Inn? Yes, as in Algeria on the Barberry Coast of North Africa. The answer: pirates. Back in June of 1631, Baltimore was sacked by a band of Moroccan, Dutch, Algerian and Ottoman Turk pirates. The objective was the capture of slaves, and more than 100 villagers were captured, most never to see Ireland again. Apparently some lived out their days as galley slaves, “rowing for decades without ever setting foot on shore”. That is probably too much rowing. We won’t do that. In addition to the rich history of the towns and villages in this part of Co. Cork, a big attraction is the sheer beauty of the scenery. Cliffs plunge to the sea, islands dot harbours and follow the coast while in between little beaches entice you to stroll. Look-outs and headlands offer views inland over green rolling hills laced with trees, stone fences and winding lanes. Seaward are the great shipping channels and yacht racing courses of the untamed Atlantic Ocean. Visitors can stay on shore and explore the Wild Atlantic Way. We will use the shelter of the rivers, islands and lakes to get a wonderful taste of coastal rowing in spectacular scenery. How to Choose: Italy or Ireland? Non-rowing companions welcomed. Program for non-rowing companions includes cycling, walking, kayaking and sightseeing options. Guide services and tour support. Trip guided by Ruth Marr, Hans-Jürgen Koch and other local rowers. 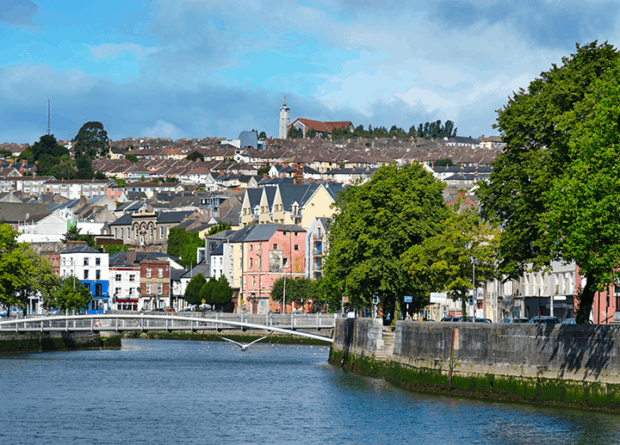 Have you considered our Four Rivers in Ireland trip which will run in May 2019? That Ireland rowing tour is for women only this year. Weather and tides are important factors in this region, which may mean that the itinerary must be modified from what is indicated here. In particular the sequence of the rowing from Baltimore could vary. Safety is a priority. Arrival in Cork. 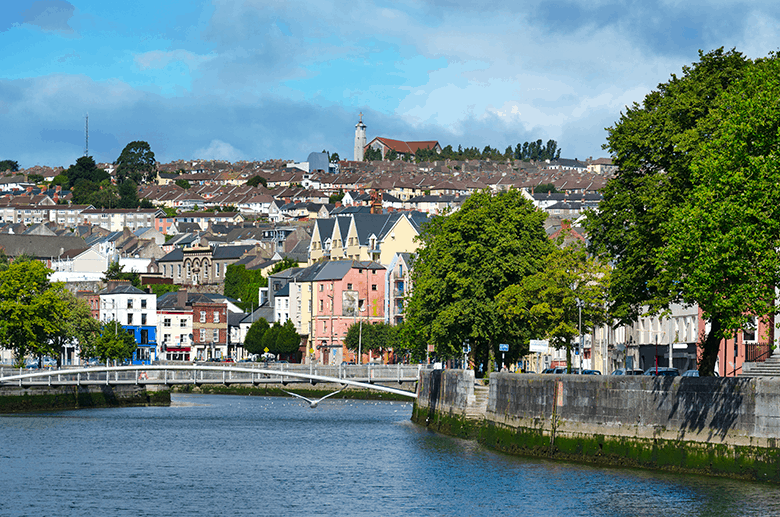 There is a lot to enjoy in Ireland’s second largest city. History and culture is everywhere to experience, perhaps best done by strolling the distinct districts and sampling its food and pubs. But leave room for our welcome dinner with a briefing for the week ahead. The rowing begins. After a leisurely breakfast, we will explore Cork from the River Lee, out of a base at Shandon Boat Club. The tides and wind will determine the final itinerary, but we should be able to row both upriver through the downtown as well as heading downriver towards Cobh. This is the setting for the famous, or maybe we should say infamous, Ocean to City race which will take place the weekend after our tour. Originally conceived as a traditional fixed boat race, modelled after London’s Great River Race, all manner of rowing shells are now welcomed. Regardless of what you row, as the organizers say “An Rás Mór is much more than just a race… it is a test of endurance, a personal challenge and a shared effort.” There is a real history of hard rowing in this area! Our paddle will be significantly more relaxing, followed by a BBQ at the club. Relax for the rest of the afternoon, with dinner on your own. We have a couple hours drive in the morning to get to West Co. Cork. Depending on the tides we may go first to Baltimore or else directly to Skibbereen Rowing Club. It is a modest building for the fabulous success that it can claim. Our coastal rowing quads will be waiting for us here. We will launch and row down River Ilen to the sea. Timing the tides just right means that we can take a lovely little branch of the river, only passable at high tide. We will row the boats to Baltimore. One guidebook describes Baltimore as a “crusty old seadog”, meant in an endearing way. It is a small village but authentically maritime, both with its fishing traditions and modern day yachting. We will wrap up the day with a walk to the Baltimore Beacon, also known as Lot’s Wife, guarding the headland. Today is our opportunity to enjoy the local waters of Baltimore on this Ireland rowing tour. We will explore the Carbery Islands, rowing around Sherkin, Heir and the Sceams. We will be able to land on various beaches, with our non-rowing friends joining us by ferry for a picnic lunch. Once the boats are back and washed, it is a short stroll from the harbour up to Bushe’s Bar. It is packed to the hilt with seafaring paraphernalia. There are amazing photos and terrific maps including one that lights up the lighthouse that flash at the same pace as the real ones do – or so we are told. We will pass the Baltimore Beacon and head out onto the big, open Atlantic Ocean! Accompanied by our safety boat and with the quads coxed by experienced coastal rowers, this is a wonderful time to experience the epitome of coastal rowing. It could be absolutely calm, or we may be rowing through waves and swells. How about a little surfing with the coastal boats? Depending on tides we will pass between the shore and a line of islands, or we will go all the way around them. Look carefully, and you might see the entrance to Loch Hyne, a limnological wonder which despite its tiny size used to boast a marine research station. Our likely destination is Trigunda Beach, where we will have a picnic lunch before heading home to Baltimore. We have one more day of rowing, with many options to choose from. Which of our first rows did we like the most? We will do more of the same. There are many more islands to explore and of course lots of coastline calling us. We could choose to make a short row leaving us time for some walking and touring along the beautiful coastline of West Cork. Rolling hills stretch west from Skibbereen. Tiny roads network to small villages with names like of Ballydehob, Crookhaven and Goleen and beaches like Barleycove. One destination could be Mizen Head, the most southwesterly point in Ireland. Spectacular cliffs plunge to the ocean, and the very tip has now been separated by a chasm, spanned by a bridge. Seabirds whirl and call above the dashing waves. What a dramatic way to end our Ireland rowing tour. A fond farewell dinner tonight in a restaurant by the sea. After a final Irish breakfast, we will transport the group to Cork airport. From there it is also easy to get to the train station or other destinations. We hope that you enjoyed this taste of Irish coastal rowing!